There are a few things that are essential when you’re pregnant and one of them is good bras that are suitable for pregnancy and beyond if you wish to breastfeed your baby once he or she is here. Your breasts go through so many changes throughout pregnancy and after the birth of your baby too so it’s essential that they get the support they need and that you get the comfort you crave. Generally, it’s recommended that you opt for bras that do not have underwires as they can inhibit blood flow and hamper milk production. Your breasts get ready for making milk early on in pregnancy and, if you’re pregnant, you’ve probably noticed changes already. Underwires can also cause discomfort for tender, growing breasts so that’s another reason to avoid them. Maternity bras are often designed to last you through pregnancy and breastfeeding, so they usually have cups that you can open easily to get access to your breasts for feeding your baby which is another important feature, of course. There are so many different brands or maternity bras out there – how do you find which ones are best for you? I’ve recently been introduced to a website that takes out a lot of the guessing work and hassle of finding good maternity bras and lets you do it all from the comfort of your home. NursingBra-Shop.co.uk offers lots of information about sizing and fitting as well as answers to frequently asked questions about nursing bras. You can browse bras by brand or by size which is incredibly useful and will help you narrow down your search to find bras that are suitable for you. If you’re still struggling, check out their page of recommended nursing bras which features the very best, most highly recommended maternity bras that are all very comfortable, popular and easy to pick the right size. It’s a small family run business that’s been going for over 10 years. They offer 120 day return, free UK Postage & Packaging and in many cases they are quite a lot cheaper than Amazon. I have two new maternity bras from NursingBra-Shop.co.uk and I went for the Bravado Body Silk Seamless Yoga Nursing Bra in Charcoal Heather and the Heidi Klum Dreamtime Nursing Bra in Blue. I chose the Bravado one as it looked so comfortable and soft and I’d heard lots of good things about this bra on social media from other mums. The Heidi Klum nursing bra range has some stunning designs that are a bit more luxurious and glamorous with lace, pretty details and fun colours and I thought it would be nice to have a maternity bra that is functional as well as pretty to look at. The Bravado Body Silk Seamless Yoga is not only very comfortable but also a good choice for low impact exercise like yoga, pilates or walking. It’s a great choice for an everyday bra and it’s comfortable enough to wear at night too which you might find yourself needing during pregnancy for support and comfort or when breastfeeding to keep nursing pads in place. The wide rib band is comfortable and easy to adjust to your size. The fabric is soft and stretchy, and the seamless design adds to the comfort too. The stretchy fabric allows for changes in bust size as your breasts change and grow throughout pregnancy and when your milk comes in and as your breastfeeding patterns change. The fabric features Anti-Microbial Silverbreeze technology to prevent the growth of bacteria, helping to keep the bra nice and fresh. 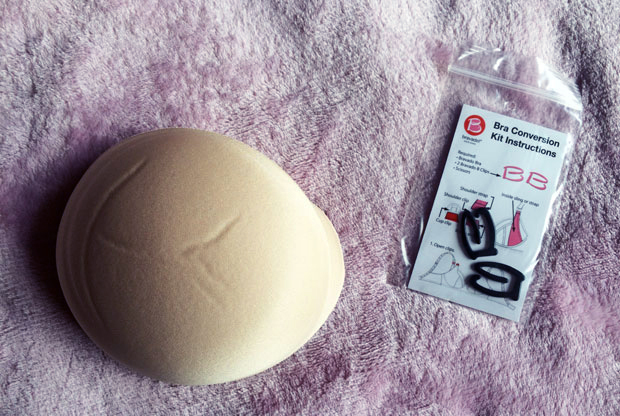 It comes with removable foam inserts for shape, but these are too rounded for my natural breast shape, so I use the bra without them. The bra also offers the option to use the straps criss-cross over your back, if you wish. The cups themselves are easy to open and close one-handed for feeding and they drop away fully which is great. This non-wired bra is available in four sizes (Small, Medium, Large and Extra-Large) and the size chart on the website makes it easy to pick the correct size. I went for a size Medium which fits me very well with room to grow a bit as my milk comes in. I’m very happy with this bra and know it will be used a lot through my pregnancy, breastfeeding journey and probably after that too! The blue Heidi Klum Dreamtime Nursing Bra is absolutely gorgeous and actually very comfortable too. Due to the lace, I thought it wouldn’t be as comfortable but it’s lovely to wear and very soft. It’s not got any underwires or padding and is a bra that looks great as well as being practical. The cups are really easy to open one-handed for feeding and the fit is great! The rib band is thinner than the Bravado one but still comfortable and it’s got lots of options for size adjustment. I love that I’ve finally found a maternity bra that’s really pretty and that fits me well. I have it in size 36C. I’m usually a 36A but pregnancy has made my breasts a bit bigger and I know that when I’m breastfeeding, they’ll grow more too. I wasn’t sure if 36C would be too big but the Heidi Klum bras are not available in A or B so I gave it a shot and it fits so I’m very happy about that. The beautiful design definitely cheers me up too! I love the colour of the bra, the lace and the red bow trims. NursingBra-Shop.co.uk helped me find two great nursing bras that fit me perfectly. All the information you might need is on the website and the whole process was so easy. Product samples were provided for this review. As always, all my reviews are 100% honest and all thoughts and opinions are my own. Such lovely bras. It’s always hard to find decent nursing bras so am excited to check out this site. Especially like the idea of the free returns as sizes often come up small on me for some reason! I found the size charts really helpful when trying to find the correct size for the different bras. Bra shopping can be so difficult and sizing can vary so much from brand to brand. This is so helpful! I think nursing bras were the best investment I made when breastfeeding. These look fabulous! This website sounds great! I used Bravado nursing bras and OMG they were comfy! These both look gorgeous – I need to get some more nursing bras ready for #3s arrival in early December. I love that the site is full of info – I’ve forgotten everything from last time about measuring up!